Dashiell Hammett may be better known today as a character himself than as a creator of fictional private detectives. He keeps popping up in books and movies as a boozing private eye in his own right, or as the mentor and lover of playwright Lillian Hellman, or as a Communist sympathizer who defied the McCarthyists. 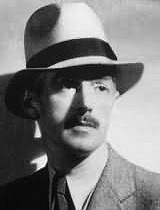 Some admirers would go further and claim Dashiell Hammett's influence on modern American literature is comparable to that of such mainstream literary lights as Ernest Hemingway, John O'Hara, or John Steinbeck. They all emerged as writers in the 1920s and 1930s and had similar impacts on American writing. Writers for the rest of the century emulated their clear, colloquial, evocative but understated prose—in both high literature and and genre work. Yet Hammett produced only a handful of crime and mystery novels in his lifetime and nothing past the age of forty. He was born in Maryland, USA, and grew up in Philadelphia and Baltimore. From his mid-teens he held a variety of menial jobs until he became an operative for the famous Pinkerton's Detective Agency, which would give him material for his later short stories narrated by the nameless "Continental Op". He was a sergeant in both World Wars I and II. But it was between the wars that he became known as the master of American detective fiction. 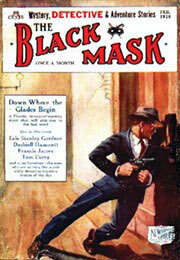 After the First World War, he took to writing for magazines, notably the pulp detective periodical Black Mask. He developed a style of writing in which the literary frills are completely eliminated to focus on the dialogue and action. Yet this did not prevent his stories from having realistic characterizations or heart. Rather these were to be inferred from the terse speech and the behaviour of his characters. Hammett's prose was clean and entirely unique. His characters were as sharply and economically defined as any in American fiction. His gift of invention never tempted him beyond the limits of credibility. The Glass Key (1931) follows with one of the most telegraphically written stories you'll ever read. It's a personal favourite of mine for how much it leaves unsaid and for its cynical peek into the kind of corrupt politics that once ruled American cities. (Different from the kind of corruption that rules today.) It's also a good mystery, although that aspect seems less important by the time you get to the solution. The hardest of the hardboiled. Made into at least two films, including a passable version starring Alan Ladd and Veronica Lake in 1942. And that's all he wrote, at least for books—apart from Woman in the Dark, A Novel of Dangerous Romance (1933), which was a hardboiled novella originally printed in three magazine instalments, and some unfinished pieces that occasionally surface. For almost three decades until his death in 1961 he published nothing of import. Maybe it was his recurring illness from the war, maybe it was his alcoholism, maybe it was his leftist politics, or maybe it was his turbulent romance with Hellman. (Her career took off in 1934 with her first successful play as his career ended and it has been suggested his editing of her work actually amounted to co-writing.) Or perhaps it was classic writer's block. But Hammett was heard from no more as a serious writer. Still, Dashiell Hammett stands with his two most prominent successors, Raymond Chandler and Ross Macdonald, as part of the unholy trinity of great, distinctively American crime writers. Chandler and Macdonald expanded on the private eye's code, added more sardonic humour and softened some corners. And countless others have copied or parodied Hammett's style. But the original can't be beat.